Whether you live in an apartment or a brand new home, some homeowners will be stuck with a small bathroom and will need to work around their lack of space. If you're thinking of investing in a new bathroom vanity, you should keep the following space-saving tips in mind to make it work in your space. The visual "weight" of your furniture can add up quickly in a small space. According to Apartment Therapy.com, you should look into bathroom vanities that sit on legs like other pieces of freestanding furniture. This will provide a bit of visual breathing room in the space and make it feel much larger. Mirrors are an important tool in small-scale interior design, so make one work for you in this space as well. Oversized pieces are a fabulous way to add flair to your washroom, and when paired with overhead lighting, you can create a dazzling place to get ready in the morning. A bathroom vanity is a wonderful way to infuse style into your new bathroom, so look for these qualities when you're picking out the perfect piece of furniture. 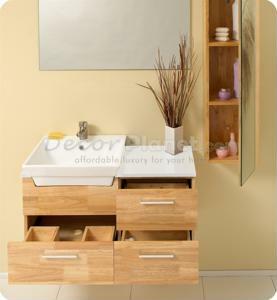 What bathroom vanity would you suggest for those with a small bathroom?